PG&E, California’s largest utility, was cleared by a state regulator of any wrongdoing related to the 2017 Tubbs wildfire. Shares spiked 75% after the news. The utility said last week that it had intended to file for Chapter 11 bankruptcy protection as it may still be held responsible in the 2018 Camp Fire, the deadliest wildfire in California history. 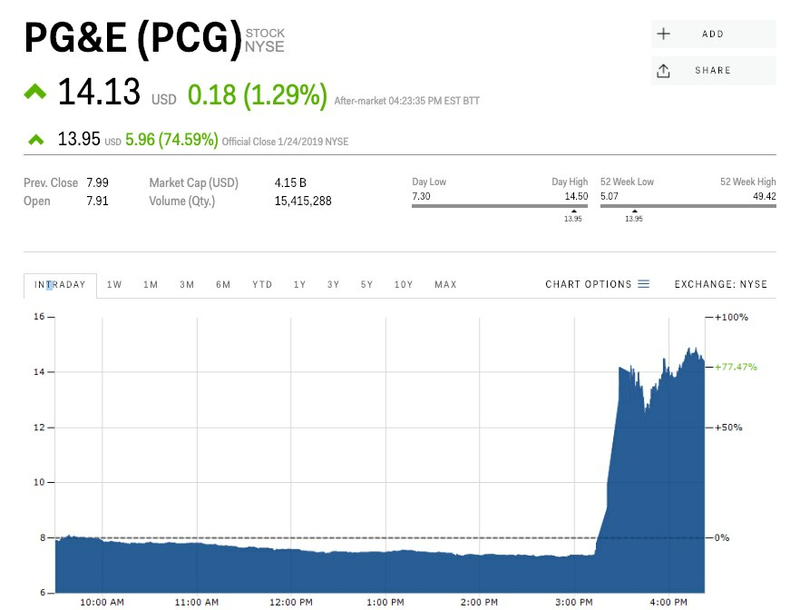 PG&E, California’s largest utility, soared Thursday afternoon, nearly 75% to $13.95, after a state regulator cleared it of any responsibility related to the 2017 Tubbs wildfire. California investigators found the wildfire was caused by a “private electrical system,” according to Bloomberg. That fire was separate from the 2018 Camp Fire, the deadliest and most destructive wildfire in California history. “After an extensive and thorough investigation, Cal Fire has determined the Tubbs Fire, which occurred during the October 2017 Fire Siege, was caused by a private electrical system adjacent to a residential structure,” a statement Thursday from the California Department of Forestry and Fire Protection said, according to Bloomberg. “Cal Fire investigators did not identify any violations of state law, Public Resources Code, related to the cause of this fire,” the statement added. Last week, the company said it intended to file bankruptcy petitions at the end of the month to reorganize under Chapter 11 protection, two months after the deadliest and most destructive wildfire in California history broke out. PG&E previously said it was having trouble with its transmission lines when the blaze erupted and that it may be responsible. Still, Thursday’s announcement was welcome news for the hedge funds that have been buying up shares of the stock. Seth Klarman’s Baupost had owned close to 19 million shares, and BlueMountain Capital held 4.3 million, according to their most recent filings. “The news from Cal Fire that PG&E did not cause the devastating 2017 Tubbs fire is yet another example of why the company shouldn’t be rushing to file for bankruptcy, which would be totally unnecessary and bad for all stakeholders,” a spokesperson for BlueMountain said. The fund earlier last week said a bankruptcy filing by PG&E was unnecessary. PG&E shares had lost as much as 90% of their value after the fire, bottoming out at $5.07 apiece on January 15.